The products have been around for over 25 years and are truly miraculous. You can use them for cleaning without fear of breathing harsh vapors or chemicals. They are terrific for dealing with mosquito bites, skin issues, low energy, raising the body's ph, stiff joints and so many other uses. Some people just buy it for the pets as they report that their cars are less hyper and more even in mood. For the 5 or 12 product packages you can choose from 22 oz regular soap, 22 oz moisturizing soap, 22 oz neutralizer liquid, 8 oz gel and 8 oz skin moisturizer to make up your package. 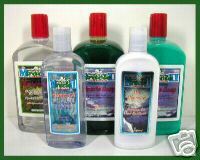 For the 2 gallon special you can choose from the regular soap, moisturizing soap and neutralizer gallons. What types of foods do you eat? If you are like most people, you sheepishly admit that though you eat some fruits and vegetables, you don't eat lots of foods that are greens and you have lots of sugar snacks. We tend to eat too much acid through the processed foods, sodas, coffee and weekend snacking. Fortunately the miracle ii neutralizer helps to balance the body's ph and we can help our body to become more acidic. This doesn't mean you can just eat junk food without consequences, but you can slip a bit and cheat as long as you tend to eat well.